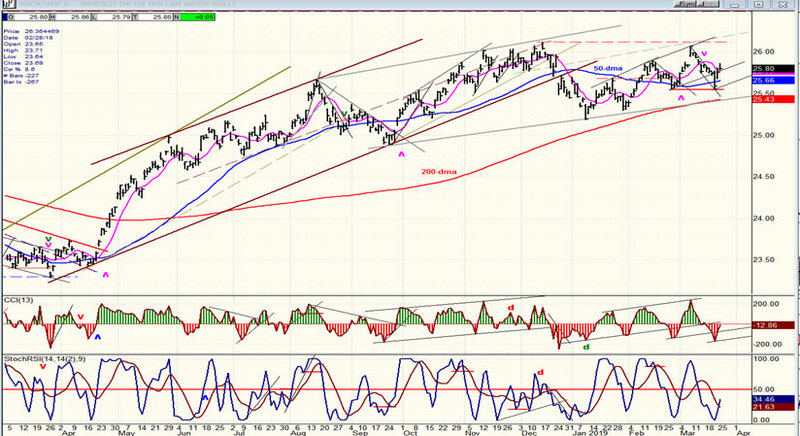 Intermediate trend – Need more time and data to assess the market’s intermediate action. Last week Ipointed to the relative weakness which had developed between SPX and some leading indexes such as IWM and XBD, all of which have a good track record at calling market tops. For a few days, I thought that the market was going to prove me wrong -- but not for long! By Friday, it was all over and my prescience was rewarded with a 54-point drop in the SPX. It is too soon to call this the beginning of an important correction. There is not enough of a distribution pattern in the P&F chart to suggest that it is anything more than a short-term decline. Additional congestion should form below the 2860 level if the topping pattern is going to grow into something indicative of a much larger correction. Additionally, the daily indicators are still mixed, at best, with the CCI still registering a strong positive value. But the weakness which transpired in IWM and XBD on Friday is a clear indication that this is not over. So, until these two indexes start to behave better in relationship to the SPX, and if weakness is going to continue, it should be in a progressive manner rather than Friday being representative of what lies ahead. unless NDX has just made a climactic top which does not require a previous distribution pattern before reversing, it may be pointing to a sideways market for a while longer. I need to see more conclusive market action before issuing a bearish forecast. The bar chart formation suggests that we are not ready for a substantial correction at anytime soon. 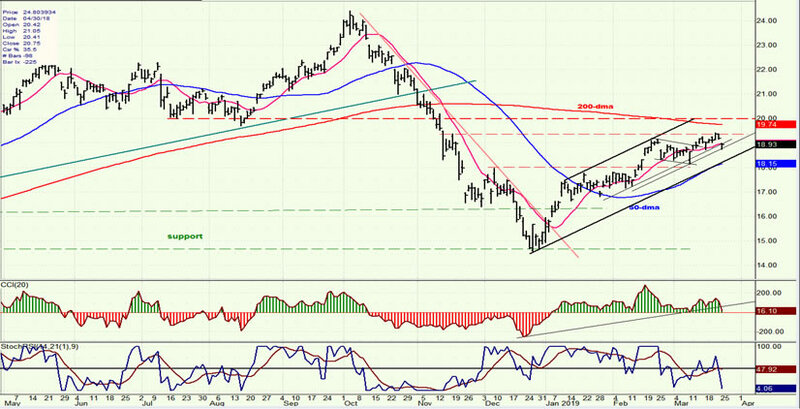 The index is likely to trade inside its short-term and longer-term channel before it is ready to have a serious decline. That would not prevent some severe catalyst occurring as a news item which would cause it to plunge through both channel lines, but barring the possibility of a bus-size asteroid heading for NY next week, I think that prices will continue to move essentially sideways until they are closer to those channel lines, and bounce off them before going through. 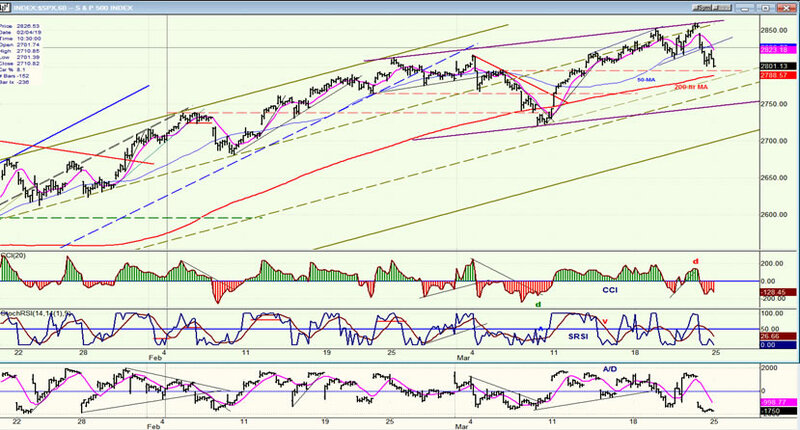 In fact, Friday’s decline is likely to find support on the dashed line a few points lower. We’ll have to see if it simply rebounds and then goes through, or goes on to challenge last Thursday’s high, first. 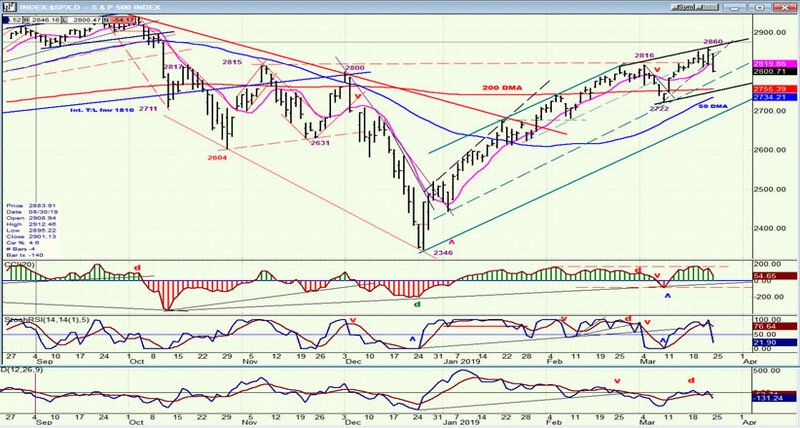 Should we come down to the bottom of the smaller channel, we’ll also find additional support at the 200-dma. And if we should break below that, we’ll have to deal with the 50-dma. In other words, we should not expect anything more than short-term weakness for the next week or so. In fact, we are probably more likely to make new highs before breaking below the 2722 level. But then, what is IWM telling us and why is it so weak relative to the SPX? Perhaps it is beginning a larger top formation which will take some time to complete while SPX and NDX rally to new highs over the next few weeks and months. Finally, you can see that the strength that still exists in the CCI is not suggestive of an imminent collapse. Let’s wait another week and see if an asteroid is, in fact, lurking around the corner! The hourly chart is starting to give the impression that the market is making a rounding top. 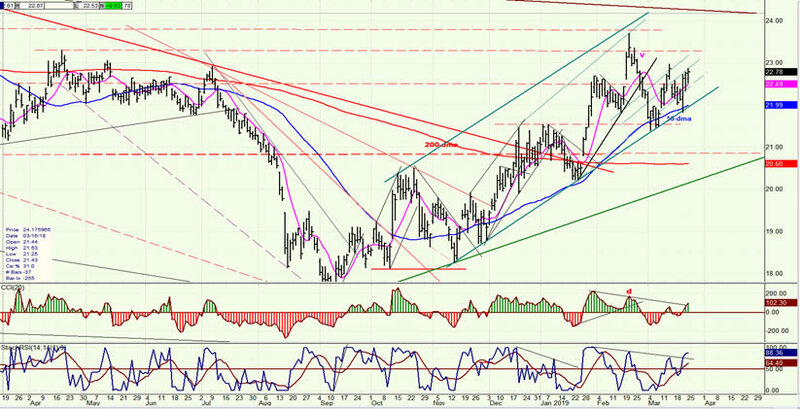 (The same trend lines and channels that appear on the daily chart have been reproduced here.) Friday’s steep decline had already found some profit-takers that held prices for a few hours before it continued into the close. The index is about to enter a zone of support which consists of previous congestion on the left, and the 200-hr MA at 2788 as of Friday. That could hold it for a while and cause a bounce which would add a little more distribution to the existing pattern so that we could drop down to the dashed line, below if not to the bottom of the short channel right away. If this is what lies ahead, we could rally for a couple of days and then drop lower before ending the short-term correction. This is what the daily indicators suggest, and the hourly as well. Although I have not labeled it, some positive divergence is showing in the CCI, and we are close to the dashed red line which could provide support since it is roughly at the target suggested by the above congestion pattern on the P&F chart. We’ll see what happens on Monday to determine if the market action is suggestive of more immediate weakness. After all, the decline is only one day old and we should not make too many assumptions this early. I have settled on following these three indexes: the strongest, the weakest, and the one in-between. I believe that this will help to get a better understanding of what the market is doing. Instead of NDX, I am choosing QQQ which is far less pricey, and therefore easier to track on a P&F chart. Since I also keep a chart on SPX and IWM, I get a better idea of what each is doing and, consequently, how it translates into overall market action. Looking at these, I believe that IWM is only giving a warning of short-term weakness at this time. After another couple of points on the downside, it should be able to stabilize and get back into an uptrend, or begin to form a larger distriution pattern. For now, I believe it is leading the market into a short-term consolidation rather than something more dire. UUP appears to be making a top. It took a hit after the FOMC report and has rallied, but the chart pattern is beginning to suggest that any subsequent upside will be limited. By next week we should get a much better idea; but breaking below the short-term double bottom (red trend line) would suggest a test of the 200-dma with a decent chance of breaking it. GDX is beginning to look a little more bullish than it did. If it can limit the next pull-back to the uptrend line/50-dma support below, AND, if UUP is, in fact, ready to start a correction, then GDX will be ready to extend its move to the top of its broad channel (top heavy black line) over the short term and later, if UUP starts a deeper correction, to about 30. I have replaced Canopy Growth with Aurora Cannabis which is also a leader in the industry. It appears to have a better percentage move ahead since it has a potential P&F target to about 13.50/14.00 over the relatively near term. It seems to move with the market, and if the market has a short-term correction ahead, it could consolidate a little more before moving higher. 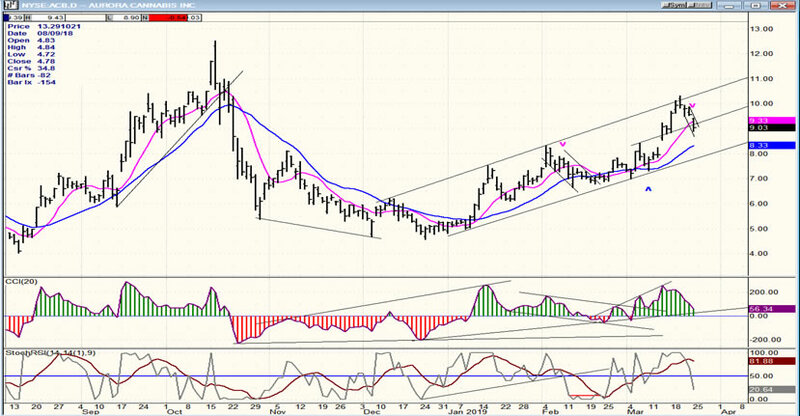 BNO pushed a little higher but has reacted to Friday’s market weakness and may have to wait until the near-term market correction is over before reaching for its 200-dma and overhead resistance, in preparation for a longer consolidation. Friday’s market weakness, as violent as it was, is more suggestive of a consolidation than the beginning of a deep correction. But hazarding a market forecast after only a one day decline is probably foolish! Let’s let the market define itself over the next week or so.